If you’re familiar with Indian food, you know that cumin (jeera) rice is served as an accompaniment to other dishes. The rice is simple, yet so flavorful and fragrant. 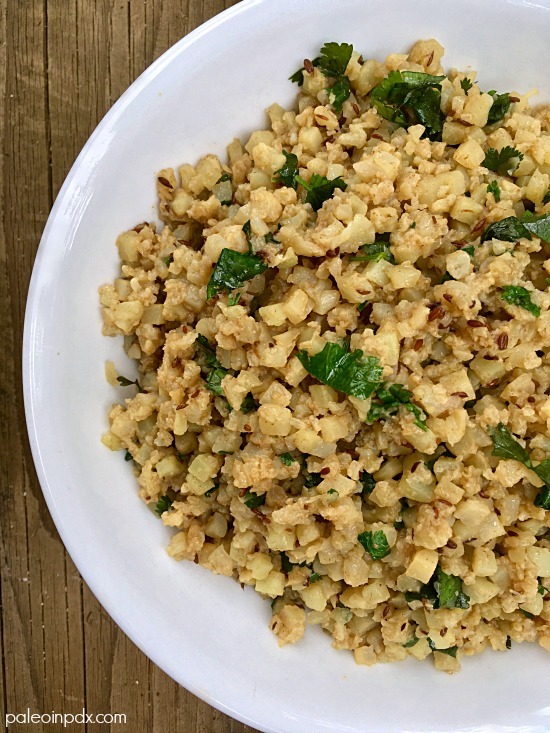 It’s been a while since I’ve actually eaten it since I still avoid grains and opt for steamed veggies in lieu of rice at Indian restaurants, but I came across it recently and knew it would be easy to make a cauliflower rice version at home. The “rice” is tender and savory, with toasty and earthy flavors. The cumin seeds definitely make it something special. It’s a great base for a meal and delicious take on plain old cauliflower rice. Next time, we order Indian food to-go, I’m going to have a batch of this ready at home! Thankfully, it comes together super fast too. On another note, I leave for Poland in just over a week! My husband and I are traveling there for adventure and exploration, and are so excited to visit. It’s going to be amazing! I consider it extra special since I have Polish ancestry too. I can’t wait! Melt ghee in a large skillet over medium heat. Once melted, add the cumin seeds and toast 1-2 minutes, until fragrant. Be careful not to burn the seeds! Next, add the cauliflower rice, ground coriander and sea salt. Stir well. Sauté a couple minutes and then add the splash of chicken or vegetable broth. Reduce heat to medium-low, cover, and let cook about 3 minutes more or until cooked to your liking. I hope you have a lovely time in Poland. Remember to take lots of photos. Bon voyage!